Tens of thousands of people demonstrated in Madrid on Tuesday September 25, 2012 to protest against the sequestration of popular sovereignty by the banks and “markets”. Repression was once again brutal, leaving dozens of people wounded, and there were numerous arrests. In this article, Esther Vivas reviews the motivations for this mobilisation and the causes of an ever more brutal police repression. “They call it democracy but this isn’t one” was the cry repeated in the squares and on the demonstrations. And as time went by, this slogan took on still more meaning. The stigmatisation and repression against those who struggle in the street for their rights has only intensified in recent times. The worse the crisis gets, the more popular support broadens for those who protest and the more the brutal repression increase. The thirst for liberty is being smothered along with the current “democracy”. Recent days provide a good illustration of this. On Saturday, September 15, 2012, when activists were detained during the demonstration against austerity in Madrid, what was their crime? Carrying a placard with the slogan: “25S: Encircle Parliament”. The next day, two wagon loads of police carried out identity checks on dozens of people in the park at Retiro. The motive? Participating in a preparatory meeting for the said action. Five days later, several of these activists were charged with offences to the highest institutions of the nation and they could be jailed for up to one year. What were the objectives of the “25S: Encircle Parliament” action? Its appeal expresses them clearly: “Next September 25, we will encircle Parliament to save it from a kidnapping which has transformed this institution into a superfluous body. A kidnapping of popular sovereignty carried out by the Troika and the financial markets and executed with the consent and collaboration of the majority of the political parties”. What will be the form of this action? Its organisers have said and said again: “non-violent”. What kind of fear is it that dictates all these police measures? Fear of violence, or of freedom of expression? As I said a few months ago at a social centre: “When those at the bottom move, those at the top tremble”. That is the truth. Fear has begun to change sides, even if only partially. The repressive measures, like those we have mentioned, show the fear of those who exert power. The fear that the people rise up, organise, express themselves freely against injustice. The fear of a handful faced with the multitude. The criminalisation of “25S: Encircle Parliament” practically began a month ago when the government representative in Madrid, Cristina Cifuentes, characterised this initiative as a “disguised coup d’état”. The former minister and PSOE deputy José Martínez de Olmos compared the action to the attempted neo-Francoist coup by Tejero in 1981: “Occupying Parliament from the inside as Tejero did or from the outside as some wish on September 25 has the same goal: the sequestration of sovereignty”. Words repeated yesterday by the PP secretary general, Dolores de Cospedal. Coup d’état? The only putschists here are the financial powers who overthrow governments as they wish and replace them by their trusted henchmen. In Italy they have sidelined Silvio Berlusconi in favour of Mario Monti, a former consultant for the Goldman Sachs bank. In Greece, they have replaced Giorgios Papandreou with Lucas Papadémos, ex-vice president of the European Central Bank. Spanish Economy Minister Luis de Guindos is a former employee of Lehman Brothers. As the journalist Robert Fisk puts it: “The banks and the ratings agencies have become the dictators of the West”. And when the “markets” come in by the door, democracy goes out the window. It is difficult to believe today that Parliament “represents the popular will”. A good number of ministers and deputies come from private enterprises, others return there as soon as their political careers end. The companies reward them generously for services rendered. Do you remember Eduardo Zaplana? First Minister of Employment, then consultant to Telefonica. Elena Salgado? Vice minister of the Economy, she became a consultant for Abertis. Not to mention Rodrigo Rato, former Economy minister, then director of the International Monetary Fund and finally president of Bankia. His adventures as head of the bank have cost us dear. Without forgetting former prime ministers Felipe Gonzalez and José Maria Aznar, the first becoming a consultant for Gas Natural and the second working for Endesa, News Corporation, Barrick Gold, Doheny Global Group and so on. So it goes. But democracy is, precisely, what the movement of the indignant is demanding, a real democracy in the service of the people and incompatible with the sequestration of politics by the business world or with the Spanish centralism which denies the right of people to self-determination. Paradoxically, it is the protestors who have been deemed to be “anti-democrats”. Anti-democrats for symbolically “besieging” the Catalan parliament on June 15, 2011, during the budget debates which involved austerity measures which had not appeared in any electoral manifesto. Anti-democrats for organising meetings in the squares and stimulating public debate. Anti-democrats for occupying empty housing and putting it to social use. Anti-democrats, definitively, for combating unjust laws and practices. And when there is more democracy in the street, there is more repression. Fines of 133,000 Euros are demanded by the Ministry of the Interior against 446 activists of 15M in Madrid; 6,000 Euros against 250 students involved in the “Valencia Spring”; hundreds of Euros against activists in Galicia, to mention only a few examples. Along with that, more than a hundred arrests in Catalonia since the general strike on May 29 and a modification of the Criminal Code to criminalise the new forms of protest. The other face of austerity is the politics of fear and repression. Not so much a social state, as a penal state. Democracy is not on the side of those who claim to exercise it, but rather on the side of those who fight for it. History is full of examples of this, and “25S” will be one of them. On Wednesday [Sept 26th], Democracy Now! also reported on the 25S “Occupy Congress” protests which they say led to at least 60 people being injured after police in riot gear had charged against demonstrators with batons and fired rubber bullets. Well, as you, as your viewers and listeners have been able to see, it’s a very serious situation here in Spain. This is just the latest of many, many protests that we have been having here in Spain, in the last year, especially, and there will be many more coming. People have lost faith in government. People have lost faith in the main institutions. And we are facing 27 billion euros in social spending cuts. Every week, the government unveils a series of new measures that affect primarily education and health and salaries and the welfare of Spanish people. And as we saw at the top of the hour, Greece is really an example of what’s coming our way, and that’s why I think people are so enraged and so worried, because they see that none of the measures imposed on Greece on in Portugal or in Ireland are having any sort of effect on the economy, on people’s welfare, on employment. And so, I think people are saying we do not want to head in that same direction. Well, the PP, the conservative government in power, even before the protests took place, they were already equating them to the 1981 coup d’état here, the military coup d’état that tried to return Spain to a dictatorship. And they, you know, posted 1,400 police in riot gear and even sharpshooters around Congress. So, the disposition—disposition was already there to criminalize protesters. And now what has happened is that those who have been arrested are being charged with crimes against the nation for trying to, what they say, occupy Parliament while in session, which is a crime. They—the, you know, protesters always said, “We’re not occupying. We’re just surrounding Parliament.” But in any case, they are being charged with crimes against the nation, and they will go before a judge, a justice, at Spain’s National Court, which is the court that’s reserved for trying high crimes such as terrorism. Click here to watch the report or read a full transcript at the Democracy Now! website. Untimely and unexpected. That’s what the emergence of this movement of collective outrage at the Spanish state was. If we had been told on 14M (May 14th, 2011) the next day thousands of people would start taking to the streets week by week and occupy squares, organized meetings, challenge the power with massive civil disobedience while staying in the streets… we would never have imagined it possible. But that’s what happened. People, two and a half years after the outbreak of the “great crisis,” said “Enough.”In the countries of Europe’s periphery, emulating the popular uprisings in the Arab world, drawing warmth from Tunis’s Qasbah and Cairo’s Tahrir Square, people took back and took over the public space. The Arab Spring gave us confidence in “ourselves” and our collective ability to change the existing order. And looking also at Iceland and Greece, the 15M movement broke with the prevailing skepticism, resignation and climate of apathy. But a year after popping up, what remains of it? What has been achieved? What challenges and prospects lie ahead? The 15M has been able to go beyond the activist core of protesters, awakening a new militant generation and lifting many people out of their easy chairs. These are young people, environmentalists, women, the elderly …, who made up the “people of the Plaza del Sol” in Madrid and “Plaza de Catalunya” in Barcelona. 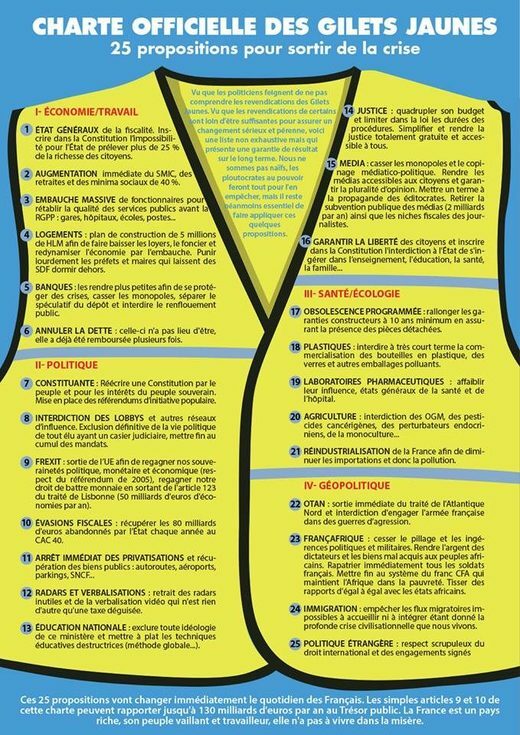 A year after 15M we see how the movement has charged both those holding economic power and those holding political power with social responsibility for the current crisis, highlighting the close links and collusion between them. 15M has unmasked a low-intensity democracy, held hostage by financial power; those who govern serve the 1% not the 99%. It has succeeded in altering the collective imaginary and the political atmosphere to its roots. The crisis has provoked a social, political and economic earthquake, but the emergence of 15M has also, conversely, generated a process of re-politicization of society. And what challenges and prospects do we face? Changing the world from bottom up is neither easy nor quick, and for this, as the philosopher Daniel Bensaïd pointed out, you must arm themselves with “a slow impatience”. We must rebuild another correlation of forces between those in power and the vast majority of society, and this requires a long march, which does not always follow a predictable or straight path. And 15M is just the prologue of this cycle of struggles that has begun. At the same time, to win concrete victories beyond some defensive ones is extremely difficult. Despite the anger and social unrest, the cutback policies are intensifying. The politics of fear and intimidation is the other face of the policy of cutbacks. But the best antidote to such measures is the massive size of the protest. How can you slander the elderly of a town who defend a clinic from being closed down? How can you smash down those who defend themselves with their books in their hands? It can be done, and has been done, but not without paying a high price in public opinion. So far, repression has boomeranged, striking back against the power. It has often been said that with 15M “fear has disappeared”, but “fear” continues to be very present in the workplace, where capital dominates with hardly any bumps. That the leadership of the major trade unions submitted to the government and the employers, weighs heavily on all social movements. We need a militant trade unionism, which has its center of gravity not in negotiations from above but the struggle from below and that defends a culture of mobilization and solidarity. International coordination is another major challenge we must resolve. Although the movement has had successful days of global mobilization, like that of last October 15th, 2011, and now the 12M and 15M, its international coordination is still weak. Capitalism is global and, consequently, resistance to it must be equally global, internationalist and built on solidarity. From the public squares to global outrage there is a road of comings and goings we will have to travel more each time. *Esther Vivas has published recently, with Josep Maria Antentas, “Planeta indignado. Ocupando el futuro” (Ed. Sequitur). First broadcast on BBC News at 12:30 am–1:00 am on Friday 9th December. Available until 4:59 am on Saturday 8th December 2012. Stephen Sackur recently spoke with Vlad Teichberg, a prominent member of the Occupy movement and a co-founder of Global Revolution TV, on the BBC news HARDtalk show. Sackur immediately put it to Teichberg that the Occupy movement was “running out of steam”, and in response, Teichberg told Sackur that although the movement has been forced to change, it is also virally spreading. Sackur: It seems to me that you do need a symbolic focus, I mean you know, ‘Occupy Wall Street’ is the phrase known around the world but you’re no longer occupying Wall Street, or that part very close to Wall Street where you were. And it seems to me, numbers generally in most of the camps that remain are tiny now. So this claim that, you know, ‘we are the 99%’ is beginning to look a bit ridiculous. There seems to be a dual standard in the western press. When these kinds of protesters are repressed in Russia, or in China or in Iran, you know, it’s a crime against democracy. When you have this in your backyard, it’s a threat to public order. Sackur: You began this movement in the late summer and it appeared to be gathering some sort of momentum. And people were expressing support for the Occupy Movement. But you never actually got mass numbers out on the streets, did you? And when you claim that you are representing the vast majority of the people, in a campaign of protest against capitalist greed and corporate greed, it’s a bit of a problem when you don’t build up mass numbers. There are a few unifying themes between what these movements are fighting for. And these are actually positive – it’s not actually a rebellion against capitalism, or against institutions of some sort, just like for the sake of rebellion. It’s actually an idea that society should be based on some fundamental humanistic principles, like equality. I mean it sounds like a radical concept but it’s actually very, very basic and human. Sackur: Well never mind that it sounds like a radical concept; it sounds like a very vague concept. And a lot of people have said… that the problem here is the message you’re delivering isn’t very clear. It’s clear what you’re against. You don’t like the modern form of US-based and western-based capitalism. But it isn’t actually clear what you want. What are your actual specific demands and proposals? Sackur: You can’t have a long-lasting and significant political movement, can you, just based on the idea that ‘people need to have a conversation’? Teichberg: But there’s much more than that – I mean I’m sorry but you sound a little ignorant. The reality is that the things that are happening at these camps in terms of processes – the idea of the general assembly – that every citizen should have an equal voice. Designing structures around that actually allow us to have a consensus-based decision-making process that pushes forward. The idea of a non-hierarchical organisation – a society that would not have any implicit hierarchy in it. It’s maybe an idea whose time has come. Sackur: You’ve made a very important point, I just want to know if that’s a model that you see being applied to the governance of cities, states, nations? Teichberg: Not necessarily. No-one said that. But it’s a model for having a discussion about our future. You see this is the thing. All we wanted to do was have a debate. We didn’t come into these camps and start setting up armies to overthrow the government. It’s a peaceful revolution of citizens. But we do want to have a conversation about the fact that the privileged class is skewing the system, skewing the rules in such a way that they always have the advantage. And the gap between the richest and the poorest is widening. And as we are having this conversation, certain things are coming to light – as the population is becoming more and more educated, of course the people who are in power are becoming more and more threatened and so now they are dispatching their armed forces to stop the debate. Sackur: Would you call yourself a revolutionary? Teichberg: No, I’m a citizen. Sackur: No, I understand that, but I say revolutionary because is what you want to see a revolutionary transformation of the society in which you live? Teichberg: I want an evolution. Revolution is a very big term: it can mean many things. What I want is evolution. I want a society that is much more fair, yes. the 99% of Britain: it’s time to turn on, tune in and stand up! Populist movements are gathering around the world. People from different generations, ethnicities, and multifarious backgrounds taking to the streets and public spaces to express collective outrage at what is happening to them. Thus the rumour of a ‘global revolution’ is spreading. So these are exciting times, though also perilous times. Revolutions have a habit of being derailed and going bad; that’s history. But I admire the optimism, the enthusiasm, and the courage of all those now actively resisting the increasingly apparent slide into outright economic and social breakdown. A week last Saturday [Oct 15th] signified the first day of truly international dissent. 15-O, which had been called for by los indignados, was marked not only by huge protests in Spain (half a million in both Barcelona and Madrid), as well as Greece and the other “PIGS” (to use the vile and frankly racist acronym so freely attached in the press), but by many in other European countries, as well as throughout the United States, and as far afield as Hong Kong, Tokyo, Mumbai, Canada, parts of South America and Africa. Click here to read a list of the 15-O “occupy” protests around the world. Mass strikes, marches and demonstrations can, of course, only take any movement so far. For real victories, a more cutting political edge is required; clear demands for a realistic and realisable alternative. Only then can any movement either steer the policies of established parties, or else, and given that almost all current political parties seem to be sold-out to identical interests, begin to build new political parties that offer genuine and viable change for the better. The simple fact is that to change the course of a country, let alone the whole world, means sooner or later picking up the reins of power. You have to get your hands dirty in the end. Whilst on 15-O there was no protest at all in Sheffield, and Sheffield was far from alone – did you hear of any action that took place in Birmingham, or Newcastle, or even Liverpool? Last Wednesday [Oct 19th], I attended a public meeting with a friend. It had been organised by Britain’s largest civil service trades-union, the Public and Commercial Services Union (PCS), and was also supported by the Sheffield Anti Cuts Alliance. We were two newcomers of the around thirty people who turned up; the great majority being experienced and committed activists, and about a half of those attending being on first name terms with one another. But a meeting about what exactly? That was what my friend and I couldn’t actually fathom. Although there was a clue in the title of the leaflet promoting the event. WELFARE, it read in large friendly letters, and beneath: “a campaigning and organising meeting for workers and unemployed people”. But campaigning and organising to what precise ends? A simple enough question, and one raised during the meeting, with someone respectfully asking what other speakers precisely meant by saying “we” all the time. It was a question that went all but unheard by most in the room. And why was the meeting only called “for workers and unemployed people”? Workers and unemployed people as opposed to who exactly? There is a sense that the anti-cuts movement in Britain is about to repeat the mistakes of 1980s all over again. The traps are set, the population having been so effectively divided against itself thanks to the policies of Thatcher and Blair. For if opposition to the ‘austerity’ programme is to be successful, then it needs to be engaging with more than just the ‘Old Labour’ old guard; we really need to find support within the other sections of the 99%. So what exactly am I saying here? That in Britain, the left is too wrapped up in itself. That it talks to itself all the time, sometimes with good intention, other times wistfully reminiscing, and still with a significant minority fixated on the Marxist dialectic. On this occasion the only Marxist to speak up, explained very eloquently how the welfare system was just another symptom of the sickness of Capitalism, which was perhaps not the most helpful contribution under the circumstances. But, in any case, what leads some on the left to suppose that the masses of unemployed and workers are about to be won over by oblique and antique instructions laid down in Das Kapital and the Communist Manifesto? Writings from the nineteenth century that most people never read and never will. I increasingly fail to understand why the left feels this need for philosophic validation to justify or promote their own visions of social justice. As Orwell pointed out, the notion that society should be fairer is really just a matter of commonsense. And Marx sort of said the same, albeit in a more roundabout and convoluted fashion, which is presumably why so many academics love him so much. Meanwhile, many of the ‘Old Conservative’ right are also disaffected, but those of the disaffected right form into different groups like UKIP and talk to themselves about how the country is being sold down the river by Eurocrats. In this they are correct, the Eurocrats being another big part of our problem. Membership of the EU is costing the nation £45 million each and every day, and for what? Others on the right try to make their opinions heard via groups like The Taxpayers’ Alliance, complaining about the increasing rates of personal taxation and how their standard of living is dropping. And in this they are correct too, but instead of seeing that their money is being stolen by the super-rich, they wrongly point the finger of blame downwards to those scraping a living at the bottom of the social heap; the irony being that they are suckered into the same phoney class war as many on the left. And here, we ought not to forget the Greens, who talk to themselves about saving the planet. And good for them, because it’s only the insane who willingly destroy their own world. But do they really think they can halt the devastation by tinkering with a corporate system as corrupt as ours? Right now by far the most important thing being to reverse the escalating economic crisis before our society breaks down entirely (as appears to be happening in Greece). This should be the immediate goal for all of the disaffected and since this requires a mass resistance to the social and economic measures being imposed, the disaffected on all sides must urgently establish some common ground. For once there is much to agree about. I might have said some of this at the meeting last week. It might even have been politely applauded, as many of the contributions were. Although I never quite understood exactly what we were meant to be talking about, and so I kept my thoughts to myself. I suppose what I was really burning to say was something like this: you cannot stop the cuts to welfare until you take on the hedge funds and the bankers. But I also wanted to say please, please, please look beyond the local issues – the fine details – we need to understand the bigger picture to get a proper perspective on what’s going on right now. And we need to learn from the many ‘occupy’ movements, which though to some extent crossing the traditional party political allegiances are stuck in another way. They have trapped themselves in a strait-jacket of the “consensus model”, which means, at best, wasting precious hours deliberating over details of where to go and what to eat, and at worst, letting the voice of a few dissenters call the tune. The simple and expedient truth being that every democratic movement needs to accept some kind of majority rules and decision-making. That said, the gathering thousands who are now camping out in Wall Street and elsewhere have set their sights on the real enemy; and in this respect, at least, the protests abroad are well ahead of ours in Britain. On 15-O, there were indeed some brave souls who made the decision to pitch camp in London, and good luck to them, though camping is perhaps an unlikely method for gathering popular support in Britain, especially now that it’s almost November. Quite frankly, I think we may need a somewhat different strategy to one adopted during a Mediterranean Spring, which in any case hasn’t as yet forced any significant concessions from their own government’s brutal austerity programmes. The important thing is not to automatically copy the action of others, but that in some way we begin taking a more visible and collective stand. We need people speaking up and joining in. This moment in history is an extraordinary one. A dire time that is also an opportunity for the most extraordinary transformation of our society since the war. I believe that such a transformation is coming whether we choose it or not. If we do nothing then our nation will undoubtedly be torn apart, sold off and slowly taken over by a small criminal syndicate – the tiny banking and corporate elite who caused this economic crisis and now sneer over us as masters might their slaves – a ruling elite that probably doesn’t even amount 1%. I’d wanted to say some of this at the meeting. How we shouldn’t only be talking about jobs and welfare, as vitally important as such issues are, because the situation we face is much worse than most can yet imagine. The rescue of our nations requiring nothing less than a sweeping overhaul of our venal and oppressive political and economic systems. An end to globalised systems in which usefulness is all that counts, and after that we can all go to hell. We, the 99%, need acknowledge our common grievances, to pool our dissent, to think bigger, and we need to act urgently… so how about another meeting next week, anyone? With the Spanish los indignados having finally reached Brussels at the end of their extraordinary march from Madrid, so on October 1st, a group of young British protesters, which calls itself Youth Fight for Jobs, set off from Jarrow on a march to London, aiming to arrive at Temple Embankment in London, 12 noon on November 5th. 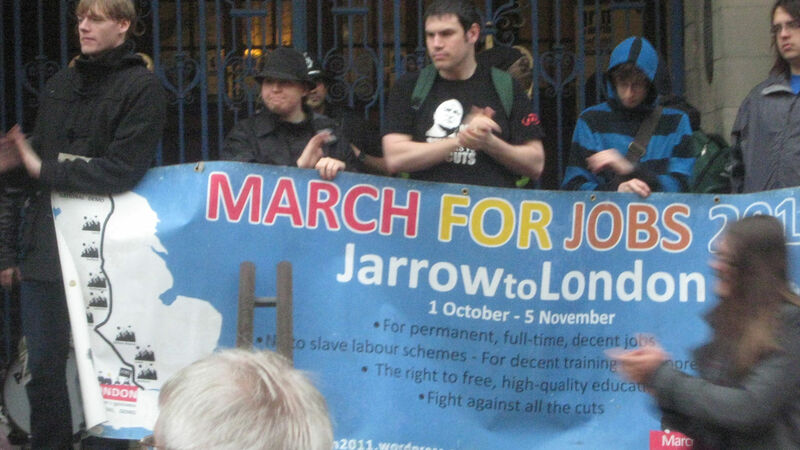 Taken from the official blog for the Jarrow March 2011. 7pm Sheffield Anti-Cuts Alliance meeting with Jarrow marcher speaking, 7pm, Sheffield University. Click here for more information about events in Sheffield. Click here to read a complete itinerary. Saturday 15th October also sees an international day of action, with calls for people to take to the streets and squares in cities and towns across the world. The event was originally called for by the Spanish los indignados as part of their Democracia real YA! campaign Toma La Calle (or “Take the Streets”). Click here for information from the Democracia real YA! official website. The Nottingham demonstration on the Jarrow March is listed as just one of a number of events taking place around Britain. As yet, no event has been planned in Sheffield. Click here for a map showing where other events are taking place around the world. 1 The Jarrow March is backed by 8 national tarde unions: RMT, PCS, UNITE, UCU, FBU, BECTU,CWU, TSSA.